Quality food, and rapid preparation in a fast-paced environment—are you an efficient and effective Line Cook? Great Line Cooks start with a passion for food. Add to their passion a dash of effective skills training to organize, prepare, and present hot and cold foods. emerit trained Line Cooks have extensive product knowledge to ensure the foods served are always of the highest calibre—creating an unforgettable dining experience that guests are eager to repeat. Everyone starts with the same basic raw ingredients, but to pick the most ripe and ready for preparation takes skill. Greater skill turns the ingredients into delicious foods, and even more turns them into an appetizing presentation. Mix that with kitchen maintenance, sanitation, safety knowledge and awareness, and you have the recipe for a great Line Cook training program. That's what emerit will do for you. 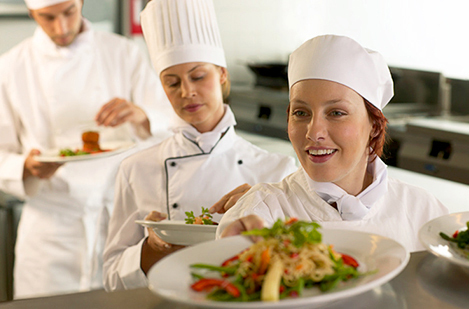 Take pride in your work; get emerit Line Cook training to acquire the skills, and certification to gain recognition. When you complete the certification process, you will be awarded the Tourism Certified Professional (TCP) designation. To get started, select the most convenient training format from the list below. "Even if some employees often do their work out of sight, their role is no less essential. The emerit Program was a great opportunity to show they were appreciated. By investing time and money in developing their skills, we showed how important they were to us." "It is a real positive return on investment for us. If you're taking that investment at first and you're certifying someone they're more likely to stay with you longer so in the end it is cheaper for you to make that initial investment at first." "I consider the people who were professionally certified a priority because if I see the certification on paper it says a lot to me. It tells me that these are people who are probably serious and successful and also that they probably want a career in the hospitality industry." "When hiring we always look at emerit training because I think it really provides a good insight into the candidate that they are very serious about the hospitality industry a career and that they are dedicated and engaged in what they do."